Casseroles don’t have to be soggy and boring. This Taco Casserole Bake is easy to put together, can be made ahead of time, and is completely customize-able! My kids love taco Tuesdays, so much that I don’t ever dare miss a single one. I love casserole night because it is a great way to use up what we have in the fridge. It’s a way for me to make dinner ahead of time with easy casserole recipes. I can put it all together in the morning, and then just pop it in the oven and top with sour cream or guacamole after our crazy after-school practice schedule. No more worrying at the last minute what’s for dinner. 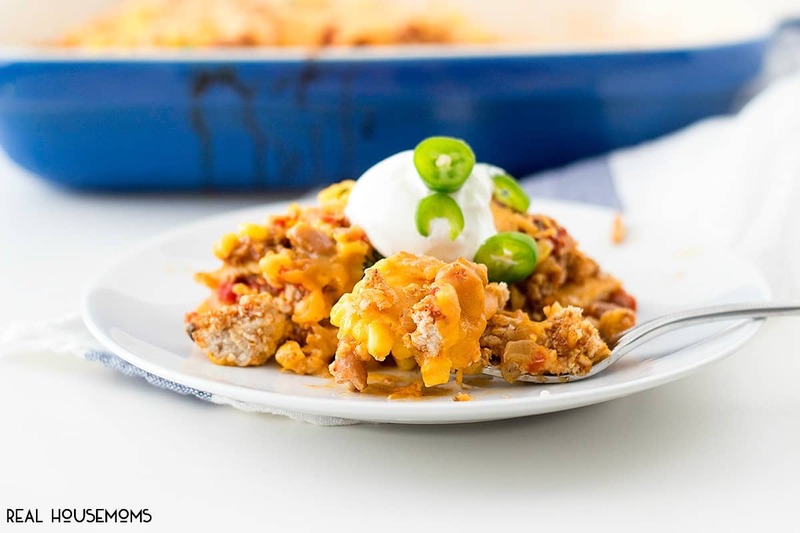 This taco casserole bake is a delicious way to combine the two together. 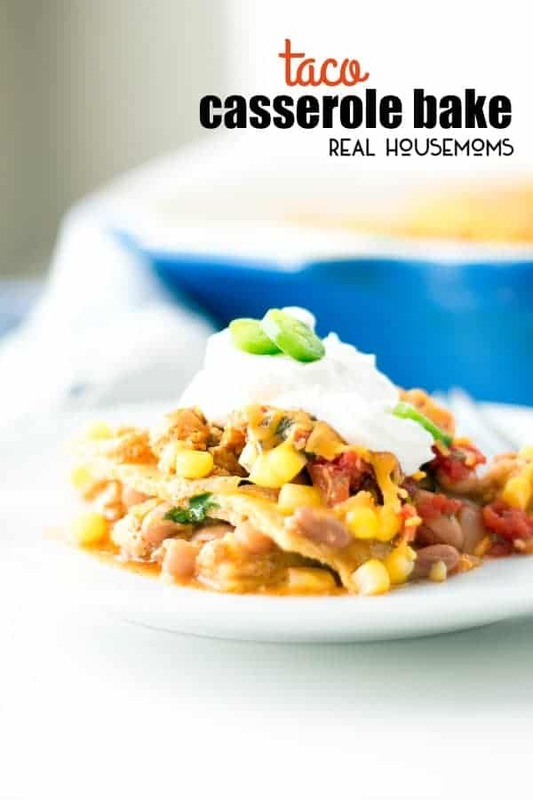 I get an easy to make casserole, and the kids don’t have to miss taco Tuesday. Win. Win. This casserole is also completely customize-able. Don’t have ground turkey, use ground beef or even chicken. No taco seasoning. No problem, add a cup of salsa with the meat. Black beans, pinto beans, even refried beans are all delicious. 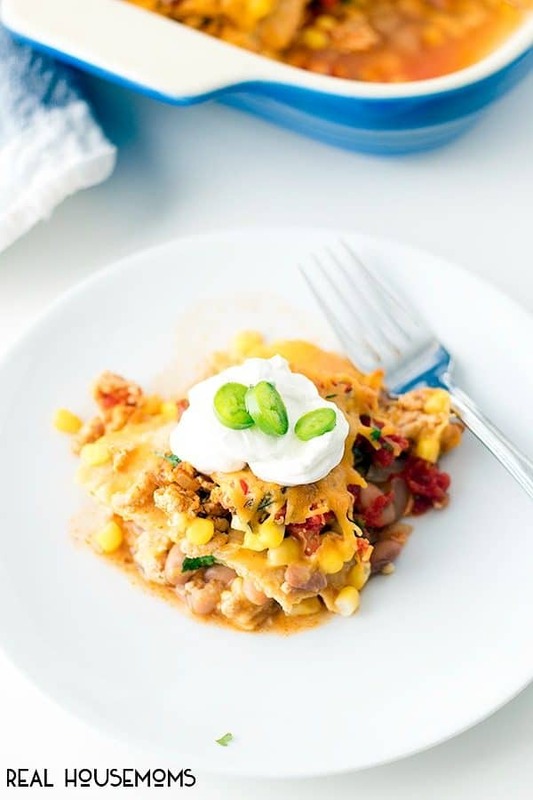 I made our taco casserole with corn tortillas because that is what we prefer, but flour tortillas or even tortilla chips are delicious. Add what you like and what you have on hand. That’s what makes this casserole so easy. Top with your favorite taco fixings and serve with a salad for a casserole dinner that is anything but ordinary. If you love tacos as much as we do you may also enjoy these simple street tacos or these easy sheet pan fajitas.